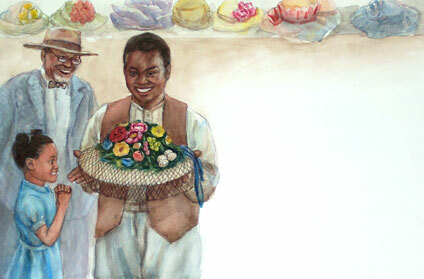 This watercolor painting as the illustration for Miz Fannie Mae's Fine New Easter Hat, a children's picture book written by Melissa Milich, published by Little, Brown and Company in 1997. In this story there was a loving father, mother, a girl and her brothers and sisters, a beautiful easter hat with flowers and four bird eggs. At Easter, we celebrate the earth’s new year of growth, after the cold, dark days of winter. Eastre, the goddess of spring, gave the Easter festival its name and favorite animal, the rabbit. The rabbit, or hare, represents love, fertility, and growth. Many people around the world have a day to celebrate the arrival of spring. Easter has its beginnings in ancient Christian holidays, pagan celebrations, and spring festivals. Long before the celebration of Easter as the resurrection of Jesus Christ, people celebrated a spring festival. The sun was an important part of the celebration. Without it, there would be no life on earth. The people feasted, danced, sang, and exchanged gifts. They rejoiced over the rebirth of life in the fields and forests. Today these customs and legends combine to make our Easter Sunday. Easter is some time between March 22 and April 25 and comes at the end of the Christian Holy Week. It may fall on the first Sunday after the first full moon following March 21 which is the first day of spring. Read More.